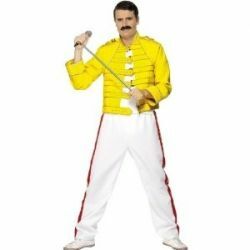 Would you like to buy Freddie Mercury costume? You can buy it here, but first take a look at why this costume is a good choice. 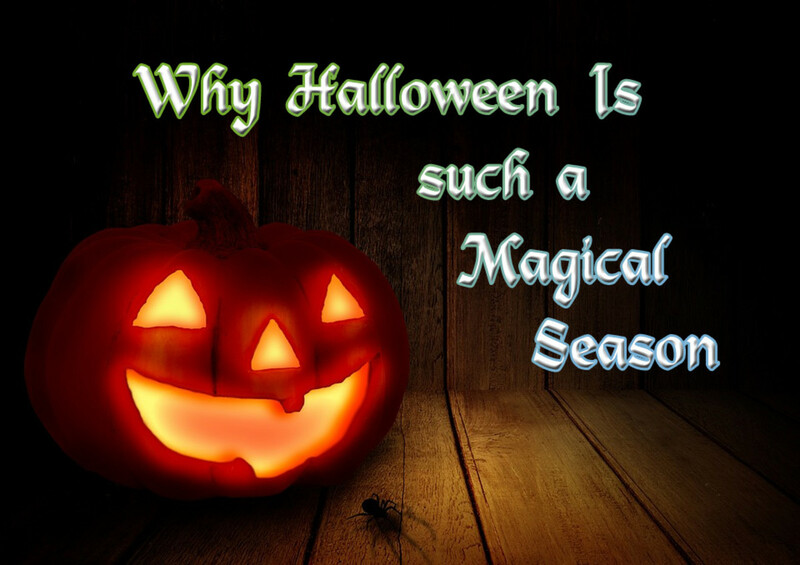 This Halloween looking for something a little different to wear to a fancy dress party or to go trick or treating with the kids? Then why not consider investing money in a great Freddie Mercury Halloween costume this year. You could of course attempt to make your own however places like Amazon offer some really great costumes and won't cost that much to purchase. You can either choose to wear his trademark white jumpsuit, not forgetting to add some false chest hair if you don't have any. Plus of course don't forget to purchase the fake moustache the same as that Freddie had. 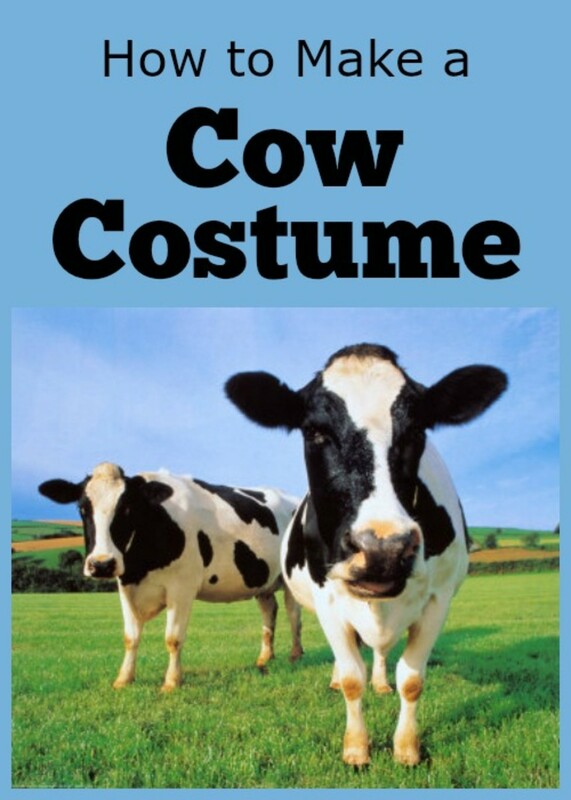 Otherwise you could go for the costume that became very fashionable in the 80's. The white trousers and of course the yellow jacket. Not only are you making a statement in this Freddie Mercury Halloween costume you will also be easily recognizable to everyone who sees you. Available in adult size standard (46 inch chest, 36 to 40 inch waist) and x-large (50 inch chest, 42 to 46 inch waist). Available in men's sizes small (36 inch chest, 26 to 28 inch waist), medium (42 inch chest, 30 to 34 inch waist), and large (46 inch chest, 36 to 40 inch waist). Play dress up with these self-adhesive mustaches! 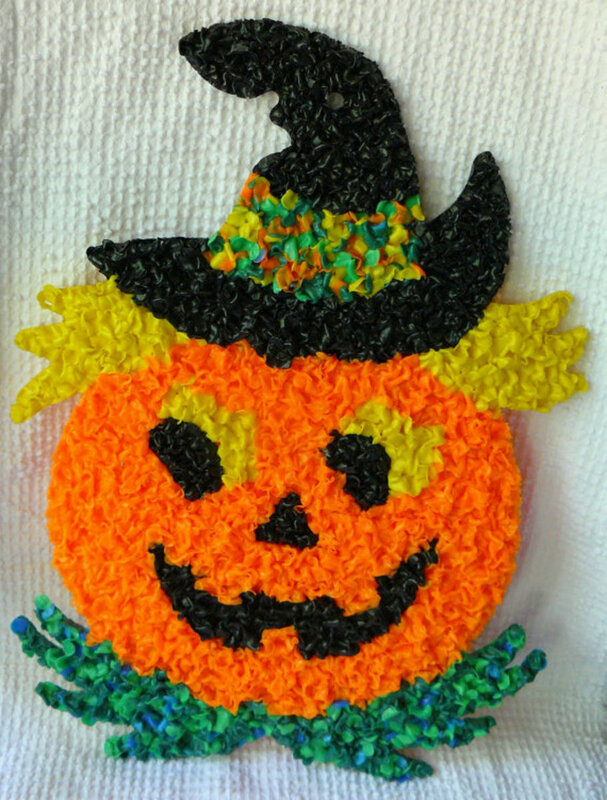 Wear one with your costume! This year is the 21st Anniversary of the death of one of the world's most enigmatic singers of all time. 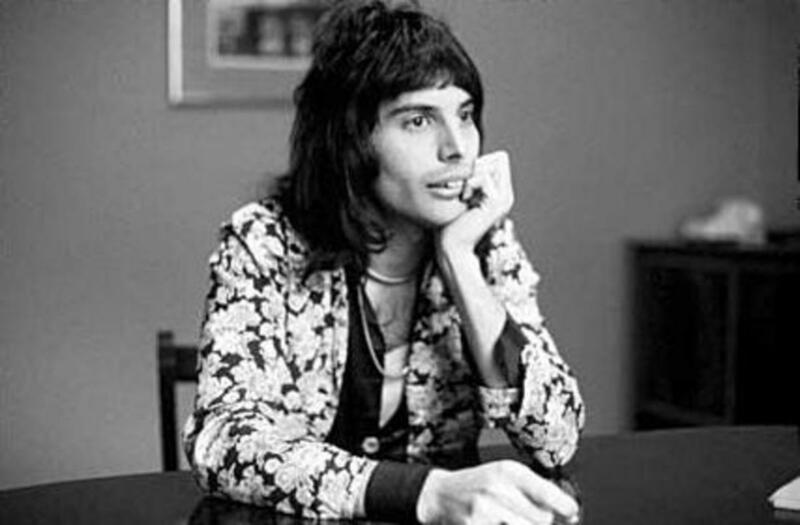 On the 24th November 1991 Freddie Mercury lead singer of "Queen" died at the age of only 45. During the years that he performed with Queen he became known for being very flamboyant. Certainly he wore some amazing costumes when performing both on stage and in the videos that the group made. 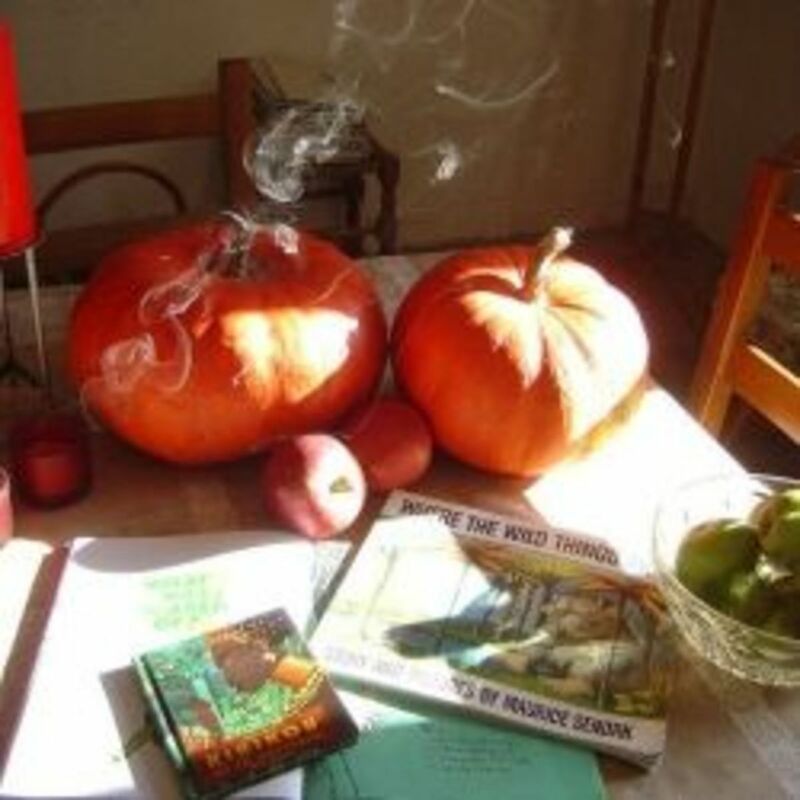 However there is one costume that really became popular with many around the world and which many choose to wear when they decide to go to fancy dress parties as him. The costume we are talking about here is the one worn in the 1980's. There are a number of places that offer this particular Freddie Mercury fancy dress costume. Over the years Freddie Mercury lead singer of "Queen" was renowned for wearing some very outlandish outfits. 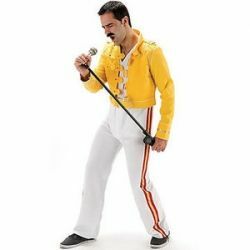 However one particular outfit that seems to be favored by most when wanting to emulate this rock god is the Freddie Mercury's Wembley costume. This is the outfit that was worn when the band appeared at Wembley Stadium, London, England in July 1986 as part of their Magic Tour. 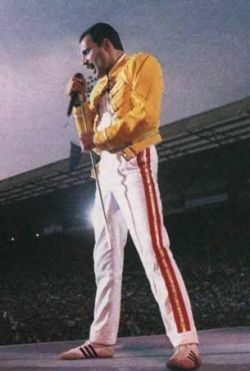 In fact of all the outfits worn by Freddie this is the one that most people will of course remember. 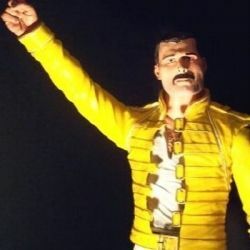 The Freddie Mercury Wembley costume which you can purchase today is made up of a yellow PVC type jacket that not only has the front fastening buckles as seen on the original but also the gold edging. Plus the outfit also comes with a pair of white trousers with the red and gold stripe running down the outside of each leg. However if you really want the outfit to look authentic don't forget to invest in a good white vest, moustached, earrings and shoes. When it comes to clothes Freddie Mercury the lead singer of "Queen" certainly could be a little outrageous. However one particular item of clothing that certainly seems to be as popular today as it was back in the 1980's when Queen were on their "It's A Kind Of Magic Tour" is the Freddie Mercury's Jacket. The jacket that Freddie wore during this tour with the band is one that helped to him to stand out on stage. As well as being bright yellow it also came with a military look due to the inclusion of several buckles on the front. Plus of course the gold piping around the ends of the sleeves around the shoulder epaulets and all over helped to make it stand out from the crowd. But of course what really helped to make this Freddie Mercury jacket so special was that someone who was extremely flamboyant wore it. 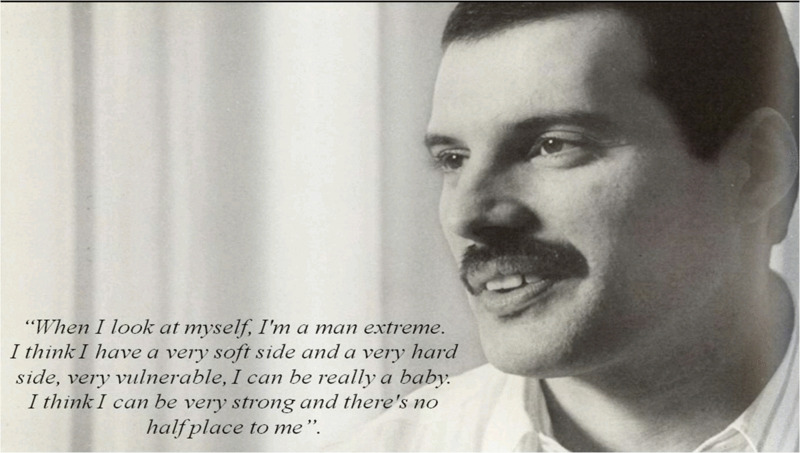 Here you can find out many things about Freddie, so you will be able to imitate him better. There is also Freddie Mercury Biopic Movie, which is not made yet, but you can find lots info about it here, including latest news. Freddie will be played by Sacha Baron Cohen. If you want to know more about other British costumes, click here. So timely! I was in a bar a couple of days ago here in New Orleans on Mardi Gras day, and Queen was playing and I was thinking how much fun a Queen or Freddie Mercury costume would be! Thanks for sharing this information and these cool Freddie Mercury Halloween Costumes, itâs very interesting! I am new to squidoo and I learn.